Next week Opera Santa Barbara comes to the Funk Zone with two exciting and unconventional opera performances…one includes a progressive dinner. This is a do-not-miss opportunity for opera lovers, food lovers, and art lovers alike. Friday, February 21st, 5:00 – 7:00 PM, MichaelKate Interiors, 132 Santa Barbara St.
Opera Santa Barbara returns to MichaelKate Interiors & Art Gallery to continue shedding light on the opera experience. All are invited to enjoy an intimate performance featuring San Francisco based mezzo-soprano, Catherine Cook; followed by a panel discussion where director, Jose Maria Condemi, and conductor, Francesco Milioto will share their insights on Opera Santa Barbara’s upcoming production of Falstaff. Come early to enjoy a glass of wine, and settle into the relaxing surroundings for a truly unique evening. 6:00 PM – Discussion with Maestro Francesco Milioto & Director, Jose Maria Condemi; Moderated by James Donelan, Ph.D. The Arts Fund of Santa Barbara & The Santa Barbara Art Foundry & Gallery, have teamed up with Opera Santa Barbara to celebrate the debauchery of Falstaff, with a progressive feast, that promises to delight all the senses! The night begins at the Arts Fund of Santa Barbara, to explore their newest exhibit of “Obsession”. Hear from artist David Diamant, while enjoying delectable light bites from Chef Pink. Guests will then be escorted to The Santa Barbara Art Foundry & Gallery for a gluttonous three-course farm to table dinner & wine pairing. 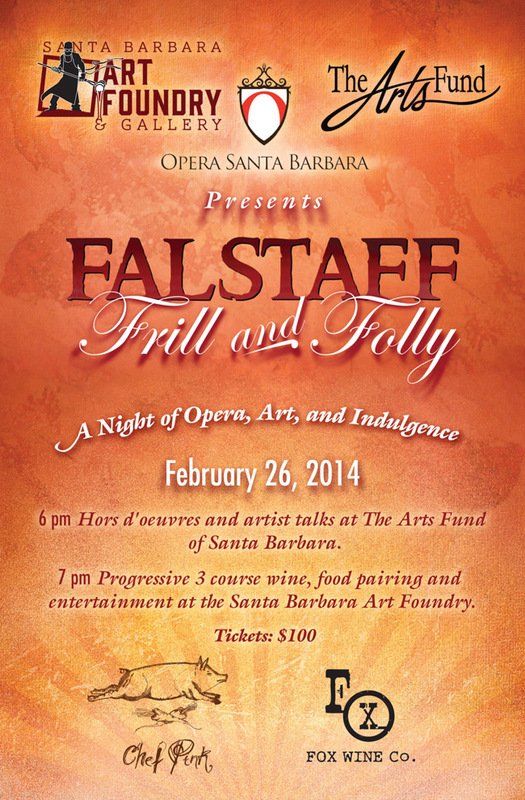 Singers from Opera Santa Barbara will serve up the entertainment in between courses. Seating is limited. Advance purchase required. The perfect light bite to finish the evening!